It takes a community of embedded designers to develop the myriad applications that are newly available each day. This series gives voice to the members of the embedded design community as they share their experiences and knowledge in their expert application domains so that designers in other application domains can benefit from their lessons learned. Whatever the end product, all designers have specific tasks to solve and their solutions will be influenced by the resources that are available and the constraints of cost, time, physical size and technology choice. At the heart of many a good product, the ubiquitous microcontroller often has a crucial influence on system power design and particularly in a brave new world that’s concerned with energy efficiency, users are entitled to demand a greater service from them. The way microcontrollers are built and operate needs to evolve dramatically if it is to achieve the best possible performance from limited battery resources. Bearing in mind that the cost of even a typical coin cell battery can be relatively high compared to that of a microcontroller, there are obvious advantages in designing a system that offers the best possible energy efficiency. It can enable designers to reduce the cost and size of a battery. Secondly, it can enable designers to significantly extend the lifetime of a battery, consequently reducing the frequency of battery replacement and for certain products the frequency, cost and ‘carbon footprint’ associated with product maintenance call-outs. Microcontrollers, like many other breeds of electronic components, are these days very keen to stress their ‘ultra low power’ credentials, which is perfectly fine and appropriate where a device’s dynamic performance merits; however, with a finite amount of charge available from a battery cell, it is how a microcontroller uses energy (i.e. power over the full extent of time), that needs to be more closely borne in mind. 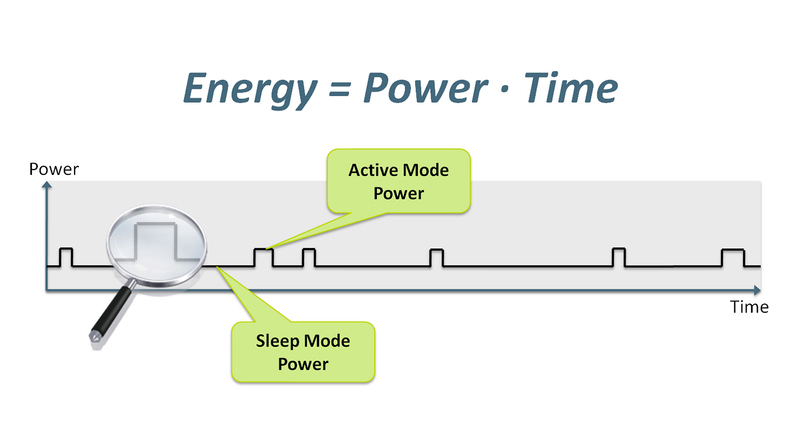 Microcontroller applications improve their energy efficiency by operating in several states – most notably active and sleep modes that consume different amounts of energy. Product designers need to minimize the product of current and time over all phases of microcontroller operation, throughout both active and sleep periods (Figure 1). Not only does every microamp count, but so does every microsecond that every function takes. This relationship between amperage and time makes the comparison of 8-, and 16-bit microcontrollers with 32-bit microcontrollers less straightforward. Considering alone their current consumption characteristics in a deep-sleep mode, it is easy to understand why 8-bit or 16-bit microcontrollers have been in an attractive position in energy sensitive applications, where microcontroller duty cycles can be very low. A microcontroller may after all stay in a deep sleep state for perhaps 99% of the time. However, if product designers are concerned with every microamp and microsecond every function takes, then using a 32-bit microcontroller should be being considered for even in the ‘simplest’ of product designs. The higher performance of 32-bit processors enables the microcontroller to finish tasks quicker so that they can spend more time in the low-power sleep modes, which lowers overall energy consumption. 32-bit microcontrollers are therefore not necessarily ‘application overkill’. More than that though, even simple operations on 8-bit or 16-bit variables can need the services of a 32-bit processor if system energy usage goals are to be achieved. By harnessing the full array of low-power design techniques available today, 32-bit cores can offer a variety of low-power modes with rapid wake-up times that areon par with 8-bit microcontrollers. There is a common misconception that switching from an 8-bit microcontroller to a 32-bit microcontroller will result in bigger code size, which directly affects the cost and power consumption of end products. This is borne of the fact that many people have the impression that 8-bit microcontrollers use 8-bit instructions and 32-bit microcontrollers use 32-bit instructions. In reality, many instructions in 8-bit microcontrollers are 16-bit or 24-bit in length. The ARM Cortex-M3 and Cortex-M0 processors are based on the Thumb-2 technology, which provides excellent code density. Thumb-2 microcontrollers have 16-bit as well as 32-bit instructions, with the 32-bit instruction functionality a superset of the 16-bit version. Typical output from a C compiler gives 90% 16-bit instructions. The 32-bit version would only be used when the operation cannot be performed with a 16-bit instruction. As a result, most of the instructions in an ARM Cortex microcontroller program are 16-bits. That’s smaller than many of the instructions in 8-bit microcontrollers, typically providing less compiled code from a 32-bit processor than 8- or 16-bit microcontrollers. The second part in this three part series looks deeper at the issues around microcontroller sleep modes. Man vs. Machine: What’s behind it? The interaction between ‘man and the machine’ today is very different when compared to 20 – even 10 – years ago. Major changes include how a person interfaces with his everyday consumer device such as a smart phone, notebook, tablet, or navigational device. 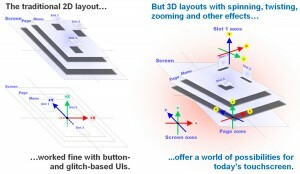 In the past, a user might push several mechanical buttons to play a handheld game or control household appliances, whereas now, they can use various touch gestures on a screen to play a handheld game, look up directions on a map, read a book on a tablet, or even control the sound of his stereo from a touchscreen. There have been a number of devices for many years with enhanced functionality but most of these features were not used because it was too complicated. Easy and intuitive interfaces open up a device for the user. Users can quickly discover the power of the device, finding it interactive and enabling them to spend hours on the device, playing with it, and enhancing it by finding new applications. So what is behind these devices that include intuitive interfaces? What is required to enable these devices to function with such rich user interfaces? The secret is good touch hardware, firmware, as well as the right algorithm and software drivers. These features are all part of a good touch solution that provides design engineers the tools to add touch functionality to various devices. Many vendors are not ‘end device’ manufacturers; rather, they make the controller and touch solution for OEMs (original equipment manufacturer). These vendors provide a complete touch system so OEMs can implement a feature-rich, intuitive interface in the device for the users. These touch solutions include the touch controller, firmware, touch sensor pattern design, sensor test specification, manufacturing test specification, and software drivers. However, the OEM needs to do an evaluation of the touch solution at the time of engagement. This is where a sensor evaluation kit showcases the capability of the solution and how the touch solution matches the customer requirement. 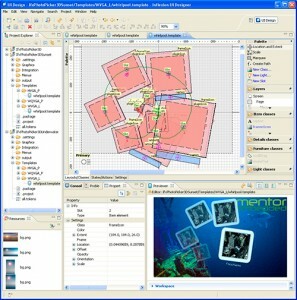 A software development kit can provide performance characterization, as well as a development platform environment to support various operating systems. A good development kit is easy-to-understand, easy-to-install, and quick. The software development kit for touch functionality is a key part of the package because it requires the design engineer to install the package himself. Easy-to-use is the key. The vendor provides the hardware and using it may require some collaboration, but the software development kit is typically the challenge for designers. The types of instructions that a touch development kit needs to provide in order to be easy-to-use include how to set-up the board, how to demonstrate the board’s capabilities, and how to configure the software settings. Vendors understand that the easier it is to use a development kit, the more robust a design engineer can make a product and bring it to market faster. Software development kits make it apparent that the designer can control these various features to offer more touch functionality to the consumers including software algorithms, gestures, lower power, faster response time, and higher accuracy. Though the interaction between ‘man and the machine’ is changing today, each year brings unlimited possibilities to the market place. The human interface to devices will continue to become easier and support more intuitive interactions between the man and his machine.